Ava’s Grace 8th annual Scholarship Scramble! New for 2018! LUAU THEME – Bring your Grass Skirts and Hawaiian Shirts! Online Golfer Registration: Check out below to pay for your golf registration with Paypal! Pay for your Hole sponsorships via the weblink further below! 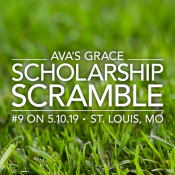 *If you would like to make a 100% tax deductible donation to Ava’s Grace in addition to your golf registration fees, please do so here: https://www.sfstl.org/donate/annual-campaign-donation (and select Ava’s Grace) or bring a check or cash to the event on May 11th! &#8226 Your name or company name/logo displayed on a Hole AND contribute to the Swag Bags! &#8226 Make your check out to: The Scholarship Foundation; put “Ava’s Grace” in the memo.